While the early Mormon settlement of Utah is often described as less violent than in other places in the West, it was not without its battles. One of these occurred near the current site of Brigham Young University in Provo, Utah. Fort Utah, which would eventually become Provo, was established in April 1849. Initial interactions with the nearby Utes were strained, yet Natives would visit the fort. Occasionally a piece of livestock would be carried off, but careful negotiations were able to keep an uneasy peace for a few months. This came to an unfortunate end within a few months when some of the settlers reacted rashly to a minor theft. In January 1850 a Timpanogos Ute man stole a shirt from a clothesline at the Fort, and in attempting to retrieve the shirt three settlers shot and killed him. They then disposed of the body in the river, where members of the tribe discovered corpse. The Indians were enraged and made preparations to exact revenge on the Mormons. To prepare a defense, Peter W. Cownover traveled to Salt Lake City to request reinforcement from the Deseret Militia. The militia left Salt Lake on February 7; in the meantime, the Indians under Big Elk fortified themselves in their camp on the banks of the Provo River. An attempt at negotiations failed and the battle began, lasting two days with no advances on either side until a final push from the Mormons routed the Indians from their fortification and up towards the mountains. From the Provo River bottoms near present-day Bulldog Blvd. and State St. in Provo, Utes were pushed back towards the mouth of Rock Canyon. In the end, Mormon casualties amounted to 1 killed and 18 wounded; of the Utes, at least three were killed including Big Elk and one woman, with an unknown number wounded. A group of the Indians surrendered and were offered asylum inside Fort Utah; another group went South to Spanish Fork and the remainder fled up the hill towards Rock Canyon where they were pursued and shot down, raising Indian casualties to between 40 and 100. One local telling links the naming of a peak above Rock Canyon to Big Elk's widow attempting to scale the cliff and falling to her death. In the spring, the surviving Timpanogos Utes carried out raids in the Salt Lake Valley, killed settlers in the Sanpete Valley, and threatened to attack Chief Wakara (Walker) of a rival Ute band for cooperating with the Mormon settlers. Patsowett, the leader of the hostile group, was quickly captured and executed, ending that chapter in Utah’s ongoing Indian wars. 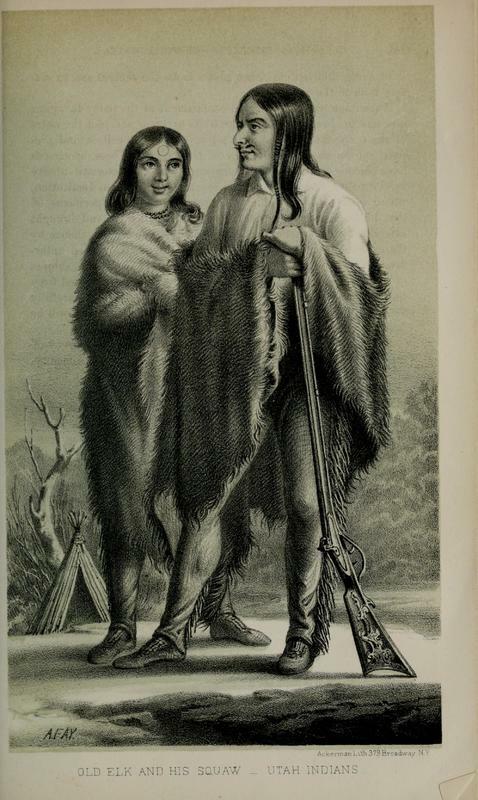 Old Elk and his Wife: This may be a depiction of Big Elk, the military leader of the Timponogots Utes, although possibly fabricated as he died of disease and exposure before the main portion of Howard Stansbury’s exploring party reached Utah Valley. ~ Source: Stansbury, Howard. Exploration and Survey of the Valley of the Great Salt Lake of Utah. Philadelphia: Lippincott, Grambo & Co. 1852. ~ Creator: From Howard Stansbury’s Exploration and Survey of the Valley of the Great Salt Lake of Utah, 1852. ~ Date: 1852. Joshua Bernhard, Brigham Young University, “The Provo River Battle,” Intermountain Histories, accessed April 20, 2019, https://www.intermountainhistories.org/items/show/44. Stansbury, Howard. Exploration and Survey of the Valley of the Great Salt Lake of Utah. Philadelphia: Lippincott, Grambo & Co. 1852. Carter, D. Robert. Founding Fort Utah: Provo’s Native Inhabitants, Early Explorers, and First Year of Settlement. Provo: Provo City Corporation, 2003. Carter, D. Robert. 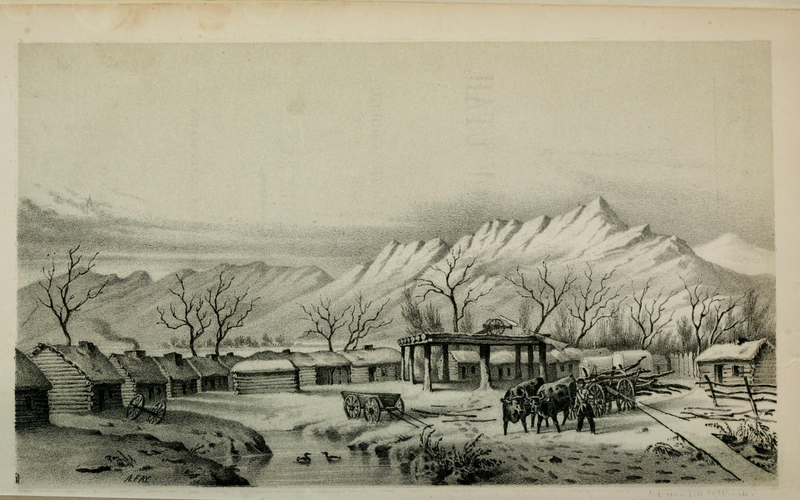 From Fort to Village: Provo, Utah 1850-54. Provo: Provo City Corporation, 2008. Jensen, J. Marinus. 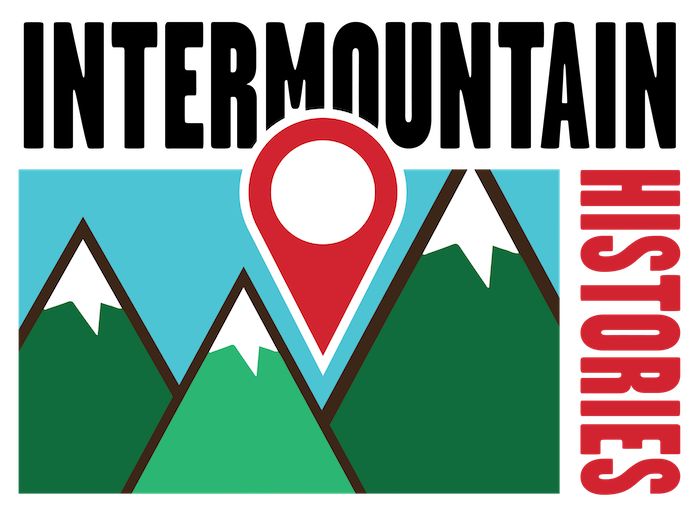 Early History of Provo, Utah. Provo: New Century Printing, 1924. Farmer, Jared. On Zion’s Mount: Mormons, Indians and the American Landscape. Cambridge: Harvard University Press, 2008.